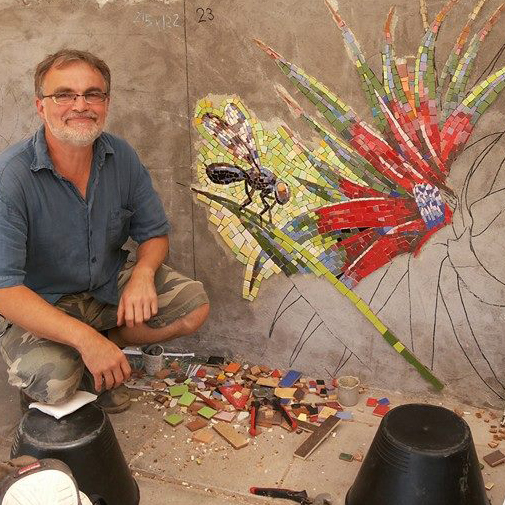 Based in South East London, artist Gary Drostle has been making large scale public mosaics for over 25years. He has won many international awards for his work including the National Tile Contractors of America’s 2011 award for Best Mosaic and SAMA’ s ‘Mosaic Arts International exhibition’ awards for 'Contemporary Innovation’ 2014, ‘Best in Show’ 2013 and ‘Best Architectural Award’ 2008. He and his team have created many major public commissions including most recently the restoration of the Paolozzi Mosaics at Tottenham Court Road tube. Andamento: What is Andamento and how do you determine the best andamento to use in your mosaic. Tamara has been a mosaic artist since 1999. She began combining her teaching skills with mosaic, doing large scale community projects as well as private residential work. She set up her company, Mosaic Art Ltd, in 2003, focussing on bringing mosaic art to the wider public. She is an inspirational workshop leader with excellent organisational skills, infectious enthusiasm and motivation and to date she has completed around 150 projects. She has worked with many Borough Councils, architects, garden designers, local groups, private individuals and over 100 schools to create site specific artwork, often involving a community element. She has also worked internationally and was chosen to take part in the Chilean Intervention. If you want to work in schools, this is the workshop for you! Tamara will lead participants through the process of setting up and running school mosaic projects, from getting the commissions, through organisation, paperwork, set up, design, workshops and installation. Participants will come away from the workshop with the confidence to solicit and successfully complete school projects. Joanna Kessel studied Ceramics and Tapestry at Edinburgh College of Art followed by an MA in Tapestry at the Royal College of Art, London. 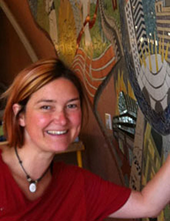 In 2010 she received a creative development award from Creative Scotland to study specialist mosaic techniques and contemporary mosaic in Italy. It was during this period that she came across the work of the Venetian architect, Carlo Scarpa, which was the start of her interest in Italian architectural mosaic. Joanna runs Edinburgh Mosaic Studio and specialises in the design and fabrication of mosaic artworks for domestic and public spaces. She creates exquisitely crafted contemporary mosaics for exhibition and shows work internationally, this year at Palazzo Tadea, Spilimbergo during the AIMC Congress and in the mosaic Biennales in Ravenna (2015/13) and Chartres (2014). An experimental one day workshop where participants will be encouraged to work intuitively with a range of traditional and non-traditional mosaic materials, responding to and exploring their inherent qualities. By working through a process similar to creative collage or contemporary patchwork, students will find that the juxtaposition of material, texture, scale and surface quality informs the development of their mosaic. Working in this way (without a pre-determined design) can be challenging as it requires students to experiment and to respond to what they find is appearing in front of them. Experimentation or ‘play’ are key to learning about the creative potential of materials, especially in preparation for working on a finished piece when you need to have a clear idea of what you are looking for – an expressive tension can be achieved between control (understanding) and accident (experimentation). The workshop offers the opportunity to explore the creative potential of materials and to begin to learn how these can be used expressively within a contemporary mosaic. Students will use both nippers and hammer and hardies to cut materials; and work directly in to cement based adhesive. Supports, cement based adhesive and a range of materials will be supplied. Students may create a finished piece or a couple of samples. We hope the experience will challenge, be informative and great fun also. Stephanie's mosaic art has been developed from her studies into nature and industrialization, landscapes and materials, environment and harmony. She has developed a mosaic process that enables her to create 'height contoured' forms that allow her to entwine juxtaposed mosaic and steel materials, creating a sense of visual harmony, while keeping their distinctive independence. Her subject matter reflects urban life-styles and personal interpretations of how she sees we may be influenced by an urban industrial landscape. This has led to her creating many personal studies that reflect her female presence in a male dominated working environment, to commissions that celebrate the legacies of Newport, South Wales: vibrant and culturally distinctive industrial heritage. A process of creating 'height contoured' mosaic art. A combination of demonstrations and practical guidance that will teach the process I have been developing. This process will allow mosaic art to lift from the surface creating new dimensions and intrigue. 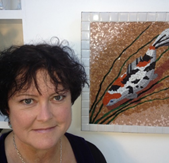 Jane is a professional mosaic artist working on private commissions, public installations and art pieces for galleries. She also runs workshops from her home studio in Hertfordshire. She uses stained glass and found objects and has recently begun a series of watch part mosaics on stained glass. She takes her inspiration from the natural world, finding that stained glass gives her the range of colours and textures she is looking for. All her glass is cut by hand and she loves to add tiny details to draw the viewer into the piece. Jane’s workshop will cover the techniques she uses to hand cut stained glass. You will produce a framed glass on glass landscape piece using a wide range of stained glass colours and textures. The workshop will focus on cutting glass with accuracy and consistency to create foliage and landscape with movement and detail.